Product prices and availability are accurate as of 2019-04-10 17:50:00 EDT and are subject to change. Any price and availability information displayed on http://www.amazon.com/ at the time of purchase will apply to the purchase of this product. We take quality (and coffee) seriously at Coffee Bear. In the rare circumstance that you feel unsatisfied with your Pour Over Coffee Maker Kit, feel free to return it for a full refund. You won't hurt our feelings...we promise.
? 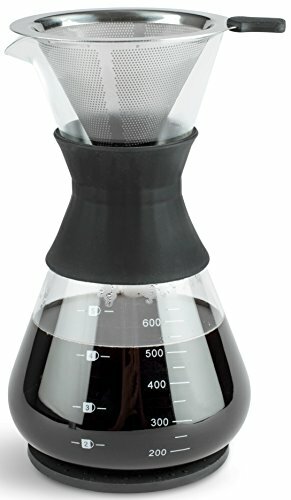 MANUAL DRIP BREWING MADE EASY ? Start by measuring your coffee. 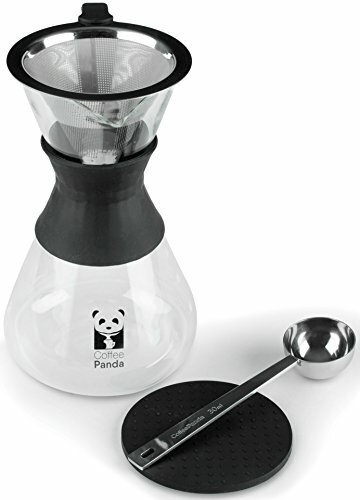 This pour over coffee kit comes with a 30ml stainless steel coffee scoop deep enough to scoop with accuracy and save the mess. The brewing system extracts the best flavors and is 100% paperless. 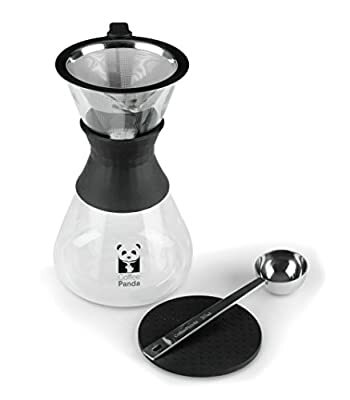 Enjoy the reusable stainless steel mesh filter cone - fine enough to prevent even the smallest unwanted coffee grounds from escaping into your coffee. You worked hard crafting amazing coffee and deserve to enjoy it. ? RICHER, BOLDER, HAND-CRAFTED COFFEE ? Been wondering how to pour the perfect, cup of hot drip coffee - just like the barista at your favorite café? 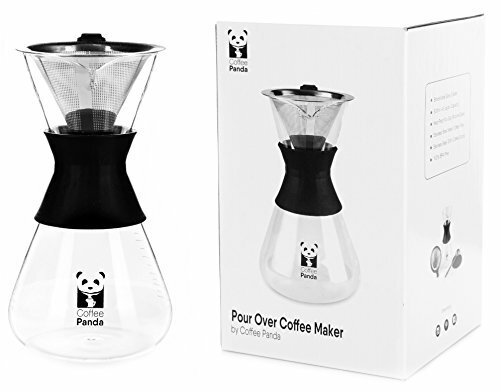 The Pour Over Method provides you with ultimate control over your cup of joe. Experiment with different grind sizes, water temperatures and various pouring techniques in order to arrive at your ideal flavor profile with precision. First time making coffee by hand? Check out our BONUS free e-book: "The Home Barista's Guide To Manual Brewing." ? MINIMALISTIC, ATTRACTIVE AND FUNCTIONAL DESIGN ?Tired of cheap glass and clunky handles? 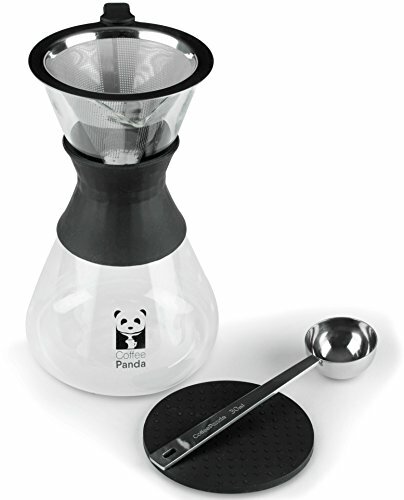 This coffee dripper is made of the highest quality borosilicate glass available. It looks elegant and classic sitting atop your kitchen counter. The curves of the glass are shaped with ergonomics in mind. Pouring is easy and precise. You will feel like a professional barista using this coffee brewer in your home kitchen. ? KEEPS GLASS, HANDS AND COUNTERTOP SAFE ? Safety is important when hand brewing coffee. 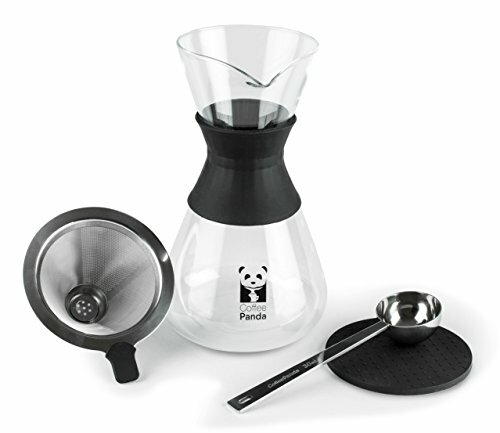 The pourover coffee maker set is fitted with a BPA-free, heat resistant silicon collar around the glass carafe. It's designed to increase grip while protecting your hands and fingers from unwanted burns. When you're not pouring, rest the coffee maker on top of the heat proof, no-slip base. The base protects your kitchen countertop from heat damage and prevents breakage from accidental bumps. ? 100% HAPPINESS GUARANTEE ? Enjoy a stress free purchase. Experience rich, bold, hand-crafted coffee with ease and elegance. Anything less than that and we'll refund your money in FULL.